Lapdog Creations: Dirty Dog? Quick Bath Wipes to the Rescue! Disclosure: International Veterinary Sciences sent Quick Bath Wipes to Lapdog Creations, free of charge for review purposes. I was not compensated for this review and all opinions expressed are my own. There's no denying the fact that dogs get dirty. And, there's no denying the fact that I get lazy when it comes to bathing my furkids. Don't judge... I know I'm not the only one. There's got to be an easy, affordable and fast way to "spot clean" my dogs between baths, right? Quick Bath Wipes to the rescue! 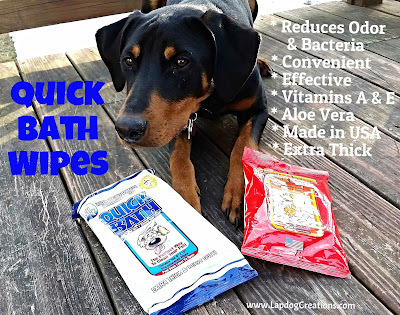 Quick Bath Wipes are gentle, yet effective wipes that have been specifically formulated to conveniently and safely remove bacteria and odors from a dog's skin, coat and paws. The extra thick, heavy duty wipes are durable, yet soothing thanks to vitamins A & E, as well as Aloe Vera to promote a healthy coat. 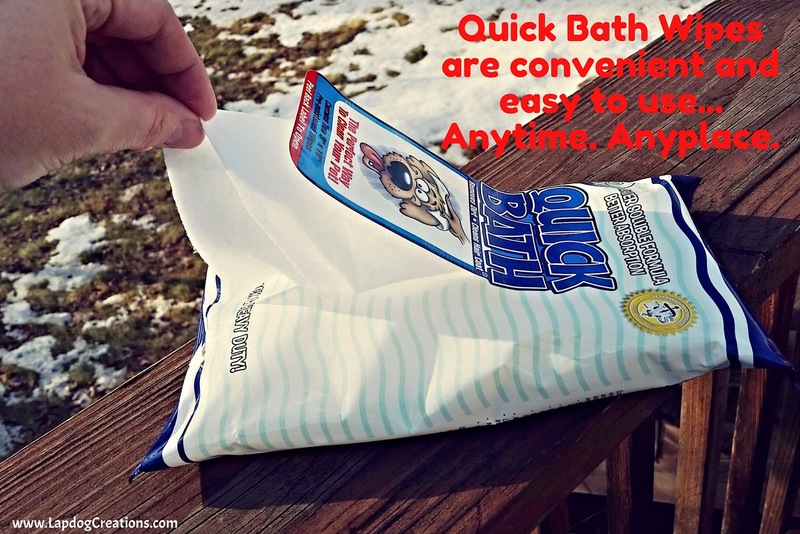 Quick Bath Wipes are pH neutral and alcohol free, yet leave your pet clean and shiny. And, they're super easy to use... just lift the re-stickable label and grab one. I have used a few other brands of "pet wipes" in the past and can attest that none have even come close to the quality of Quick Bath Wipes. One 8" x 10" wipe is plenty to give a good size dog a quick wipe down - unlike another brand where I literally had to use half the package for a "quick bath." As if that wasn't enough to make dog moms everywhere jump for joy, you'll be pleased to know that Quick Bath Wipes are Made in the USA by International Veterinary Sciences (IVS). The wipes are formulated and packaged in state-of-the-art pharmaceutical FDA & GMP certified facilities in order to achieve the highest standards for your pet. IVS, a leader in animal health and lifestyle products, has been helping pet parents have "happy, healthier pets" since 1989. In addition to the Quick Bath Wipes, IVS also manufactures an extensive line of nutritional supplements, as well as other grooming solutions. As an always-on-the-go, multitasking dog Mom, I really appreciate the convenience of Quick Bath Wipes. 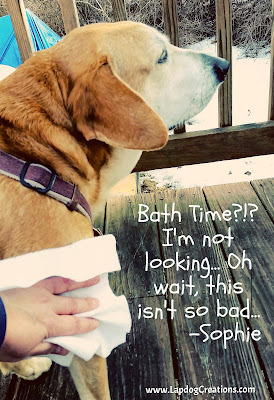 As dogs who dislike baths, the Lapdogs really appreciate the lack of water and a bathtub. Although, that doesn't stop them from the infamous post bath roll in the mud! Small Dog, 10 count, 5" x 10"
Large Dog, 5 count, 8" x 10"
Large Dog, 10 count, 8" x 10"
Cats, 10 count, 5" x 10"
Tushee Wipe, 30 count, 5" x 8"
The wipes you see our photos are the Large Dog size. We also tried the Tushee Wipes, but the Lapdogs requested that those photos be kept private... apparently they think they're celebrities or something. Speaking of which, Tut decided to do his impression of the Quick Bath Wipes cover model. What do you think? This dog mom gives two thumbs up - way up - for Quick Bath Wipes! Pick up a package or two today and keep them handy in several spots - home, the car, your RV, etc. We currently have packages at home, as well as in our travel bag. *Just to clarify, none of the Lapdogs currently weighs 130 pounds. Not even close. However, their angel brother was a big boy. **If you click through our Amazon link and make a purchase, I may receive a very small commission. I know a pug that might find these wipes preferable than being put into a tub for a bath! They would be great for quick wipe ups in between bath times. I use a lot of pet wipes. My Husky is a Therapy Dog and must always be clean. She weighs 150 lbs so bathing her myself isn't something I do often. Getting her bathed at the groomer gets expensive. Pet wipes are a big help. I like that these are extra thick, I could really use that, the thinner ones ball up quickly as you use them. Thanks for sharing! These type of products really come in handy here in Texas during the rainy season. Magic tracks mud everywhere! 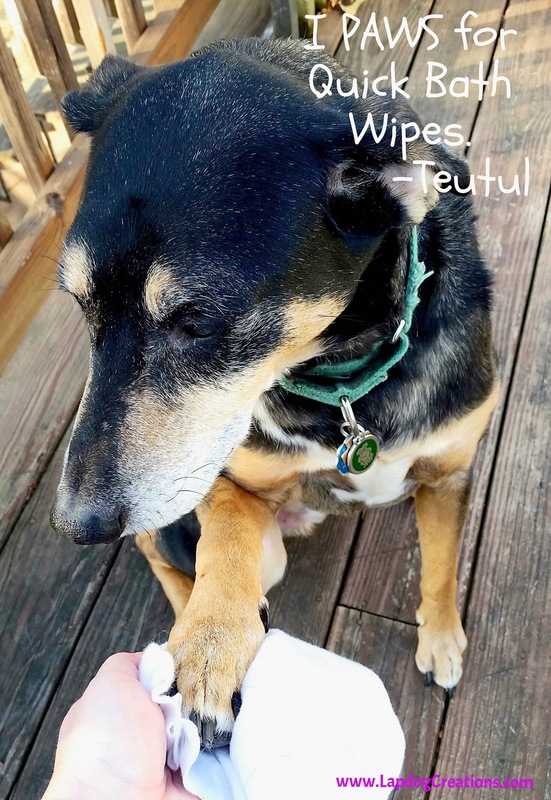 I like using wipes for cleaning Mr. N's paws. Everything sticks to his hair! We so need these for Ruby. She is a light-colored dog and at this time of year, her paws get so dirty on walks. They are also priced well and some other pet wipes are much expensive. Thanks for a great review! These are a new brand to me but I definitely always need new wipes! Sounds like a convenient product! 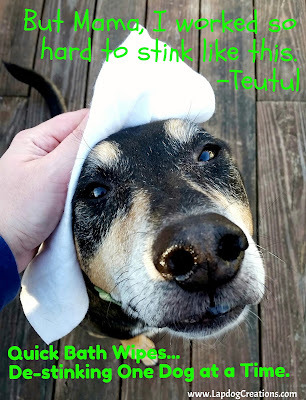 My dogs are small, so giving them a bath is pretty easy, but I might try some of these some time. We received some kitty wipes to sample. We don't get too dirty, but they were great for helping to clean our tushee. Those sound like great wipes. We don't bathe our dogs either. 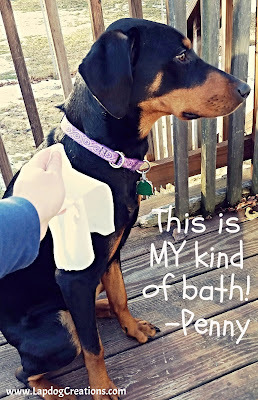 :) But I have always found wipes very helpful for puppies and quick clean ups. Thanks for joining the hop. It's nice to know that someone learned that dogs need nice big wipes. We had some a few years ago that were way too tiny. Long haired dogs have a need for wipes often. Those look very useful as none of us are fond of baths, except the Mom she loves to soak in the tub but she is very weird. We wonder how well they would work on Fenris' muddy paws?